One of the biggest gifts a person can give is volunteering their time and professional abilities to serve an challenged community. Through the years, we have had physicians and nurses of numerous specialties come to our clinic to provide excellent primary care. Through a mix of Haitian and volunteer staff, the clinic serves basic ophthalmologic, orthopedic, pediatric, pre/post-natal and dermatologic needs. Our continuity programs include hypertension, diabetes and malnutrition, well baby and vaccine clinics. The clinic also has a growing outpatient rehab center with programming in stroke prevention and management, pediatric developmental delays, and post-traumatic injury. Through partnerships with both in-country and international organizations, HMMoM through the Clinique Saint Esprit has also begun expanding basic services and first aid training within the communities it serves particularly those with members displaced from the earthquake. HMMoM is currently looking for volunteers who can come for a minimum of 3 weeks up to one year in a professional capacity. Please email haitimedicalmissions@gmail.com for more information about volunteer opportunities. 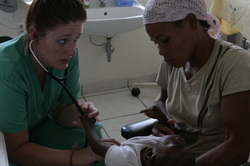 Haiti Medical Missions of Memphis is regularly looking for licensed physicians, nurses and physicians assistant to meet increasing demand of our growing patient population, and provide mentoring for the Haitian medical staff Clinique Saint Esprit Employs. Willingness to practice general and some tropical medicine regardless of personal specialty. 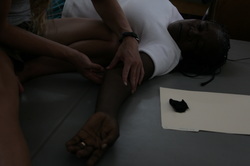 Haiti Medical Missions of Memphis is regularly looking for licensed physical, occupational, and speech therapists to meet increasing demand of our growing outpatient rehab population, and provide mentoring for the Haitian medical staff that Clinique Saint Esprit employs.